DNC in Germany supply to countries from Northern Europe have access to a huge range of GE Hi-AK axis controller drive system power units and printed circuit boards. GE Hi-AK facilities are available within the group for testing, fault diagnosis. repair and parts supply of the PWMC control boards, and PWMP, and PWMU pcb power section units of the axis amplifiers on each channel of the 2 or 3 channel GE Hi-AK drive unit. Group stock consists of hundreds of boards, for the GE Hi-AK series of axis controllers that were fitted with GE 1050, early Siemens and Fanuc controllers also. 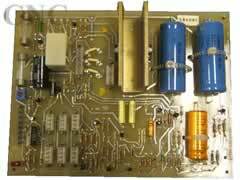 General Electric Hi-AK axis boards covered include; PWMC3, PWMC4, PWMP1, PWMP2, PWMP3, PWMP4, PWMP5, PWMU1, PWMU2, PWMU3, PWMU4, PWMU5 with our standard 180 day warrany on these and many more parts and cards for the GE Hi-AK drive systems on your machine tool.